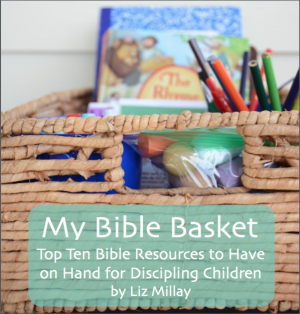 Inside: Trinity lessons for preschoolers in the Attributes of God series. Every week, I have the opportunity to visit the preschool program at our church and give a 20 minute chapel service for the kids. As I thought through what I wanted to focus on in chapel this year, I realized, “How can these little ones love, follow, and obey a God they do not know?” So this year, we are going to be learning all about who God is! 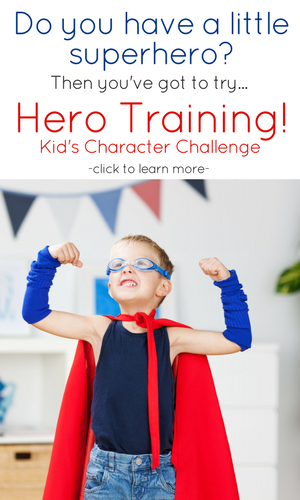 They will be learning big concepts about a big God in a super simple way. It is my hope that the more they learn about our awesome and amazing God the more they want to praise Him and give Him their hearts and lives. We will be going through many different aspects of God’s character, focusing on each one for multiple weeks at a time. 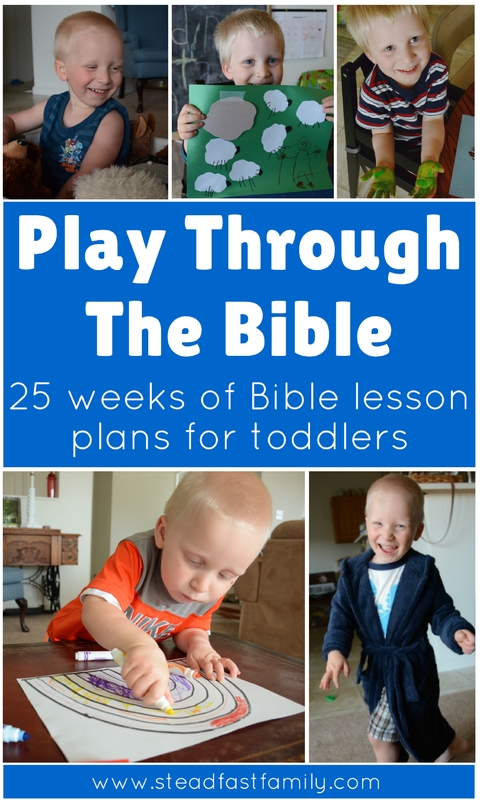 As I plan these lessons, I will keep adding them to this series so that you can follow along with your own kids – whether at home or in a group at church or school! While these lessons are written for a group setting, they can be easily adjusted for home use. 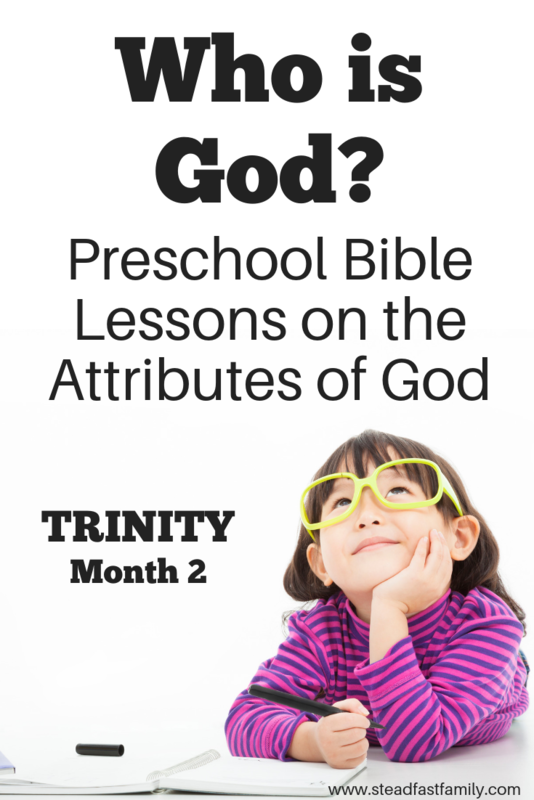 This month’s preschool lessons are on the attribute of Trinity. Find instructions for this board in month one! In the first month we tackled an “easy” attribute, God being creator. However, in month two we are jumping in with both feet into some deep water! 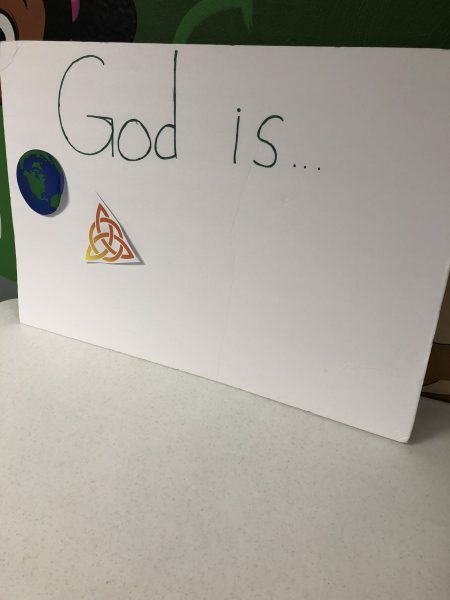 The Trinity is a concept that even the most learned scholars can’t fully explain, how are you supposed to explain it to small children? 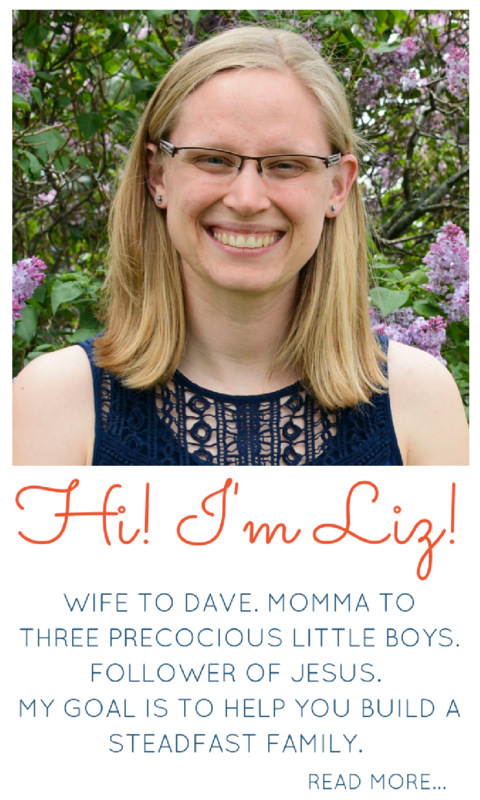 Because this can be such a tricky topic, I wrote a whole post with tips on explaining the Trinity to kids! Check it out right HERE. Introduce the concept of God as the Trinity. SAY: Today, we are going to learn something new about who God is! We are going to learn a special new word, are you ready? The word is Trinity. Can everyone say “Trinity”? ASK: Does anyone know how many God’s there are? SAY: Yes, the Bible tells us that there is only ONE GOD. Everyone hold up one finger. Only ONE GOD. But, this *one God* is so awesome and amazing that he is three persons. Everyone hold up three fingers. ASK: So, how many God’s are there? ASK: And how many persons are the one God? SAY: That’s right! There is one God who is three persons. God is God the Father, God the Son, and God the Holy Spirit. Can you say that with me? (Repeat the three persons together). Good job! We will be learning more about those three in the next few weeks. (Optional) Read the story of Jesus’ baptism. Pointing out that all three persons of the Trinity are in the story together. SAY: Jesus is all God, the Father is all God, and the Spirit is all God. And together they are just ONE God. It’s kind of confusing, isn’t it? But God just is so big and so amazing that sometimes it is hard for us to understand! SAY: Something that helps me remember this is the shape of a triangle. How many sides does a triangle have? (Three) Thats right! Let’s draw a triangle in the air and count the sides. Make a triangle in the air once or twice. SAY: Now, lets sing a fun song to help us remember the Trinity. Then end with a simple prayer! SAY: Yes, God is Trinity. Because, how many Gods are there? One! And how many persons in the One God? Three! Yes, God the Father, God the Son, and God the Holy Spirit. Today we are going to learn more about God the Father. ASK: What are some things that fathers do? Let them share some of the things their dads do. SAY: One of the best things that our fathers do for us is that they LOVE us and God the Father loves us with the biggest love in the world! I hope you never ever forget that God the Father loves you more than anyone! SAY: Now, lets sing a song to help us remember how good our Father God is to us! Have everyone stand and sing “Good, Good Father”. We added motions along with the chorus! (Review) SAY: Can you remember what we’ve learned about God? (Point to the picture of the earth on the board.) God is…Creator! And what have we been learning about God lately? God is… Trinity! SAY: Last week we learned more about God the Father and how much he loves us. Today we are going to learn more about God the Son! ASK: Does anyone know the name of God the Son? Whose birthday do we celebrate on Christmas? Jesus! SAY: Yes! God the Son is Jesus. God came down to Earth and was born as a little baby. Can everyone pretend to cradle a baby? The big big God who made the whole wide world, was born as a little tiny baby. SAY: And he was a kid like you too! Isn’t that awesome? He had to obey his parents, do chores, and learn new things just like you! ASK: But, did Jesus stay as a tiny little baby or as a kid? SAY: That’s right! He grew up. Can everyone stretch up tall and pretend to grow up? Jesus didn’t stay a baby, he grew up into a man. And when he became a man he did something really important for you and me. ASK: Does anyone know what Jesus did for us? SAY: That’s right, Jesus died on the cross. Can you put your arms out like a cross? God the Son became a human like us and even though he never did anything wrong or bad, he died. He did that so that we don’t have to die and be away from God forever. He died for us so that we can be forgiven of the bad things we do and live with God forever! SAY: The story doesn’t end there either. He didn’t stay dead on the cross! Jesus, God the Son came from heaven, down to earth, he died on the cross, and then he came alive again! Let’s sing a song to help us remember all about what Jesus did. Sing “Lord I Lift Your Name on High” with motions. SAY: Yes, God is Trinity. Because, how many Gods are there? One! And how many persons in the One God? Three! Yes, God the Father, God the Son, and God the Holy Spirit. We’ve learned about God the Father and God the Son, today we are going to learn about God the Holy Spirit. SAY: When Jesus was on earth, he said that when he went back to be with God the Father, he would send the Holy Spirit to be with us. Another name for the Holy Spirit is HELPER. Can you make this motion that means “help?” Do the sign for help. SAY: Let’s learn about the different ways that the Holy Spirit can HELP (make the sign) us. I am going to need five volunteers. Bring your volunteers up to the front. They are each going to make a motion for the different ways the Holy Spirit helps us. Go back over these with motions once or twice. SAY: The Holy Spirit helps (make motion) us in so many amazing ways! 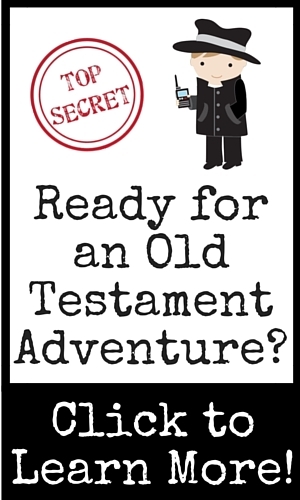 Want to hear a story about God speaking to someone from the Bible? Tell the story of God speaking to Elijah in a whisper while he is hiding in a cave (1 Kings 19:9-13). For each part of the story do motions to go along (wave your arms for the wind, stomp feet for the earthquake, etc) and then get really really quiet at the whisper part. SAY: God the Holy Spirit speaks to us in a quiet whisper too. Not with loud words, but quietly inside our hearts. Well, that’s all for the Trinity lessons! Stay tuned for next month’s (Love!). Would you like a PDF printable copy of these lessons? 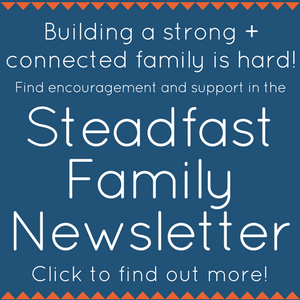 Find one in the Steadfast Family Subscriber Resource Library! Just enter your information below to become a newsletter subscriber.